Adrienne, a Multnomah County Circuit Court Judge, is the second Black female judge in Oregon’s history. She is a sought-after speaker on a variety of topics including diversity, inclusion, equity, community engagement, leadership and professional development. Throughout her career, Adrienne has been involved in many national, state, local, and specialty bar associations, often serving in a leadership capacity. 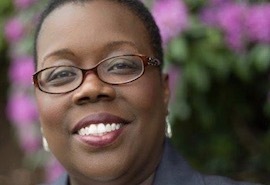 In the Portland community, she sits on the Reed College Board of Trustees and the Oregon Community Foundation Portland Leadership Council where she chairs the Outreach to the Black Community committee. She also chairs the Girl Scouts Beyond the Bars Advisory Board and the Self-Enhancement, Inc. Board of Directors. In addition, she serves as a mentor to many people. She is often recognized by a wide variety of community and professional organizations for her service and mentorship to others. Adrienne is a tireless encourager, helping people succeed by living their best lives.